BGI Fertilizers BOUGAIN 2lb Bag, Bougainvillea Plant Food by BGI Fertilizers at The Net Stores Network. MPN: 2BOUG. Hurry! Limited time offer. Offer valid only while supplies last. Not only is Bougain formulated to dramatically increase blooms, it addresses the bougainvilleas Achilles heel - their thin and brittle root system. 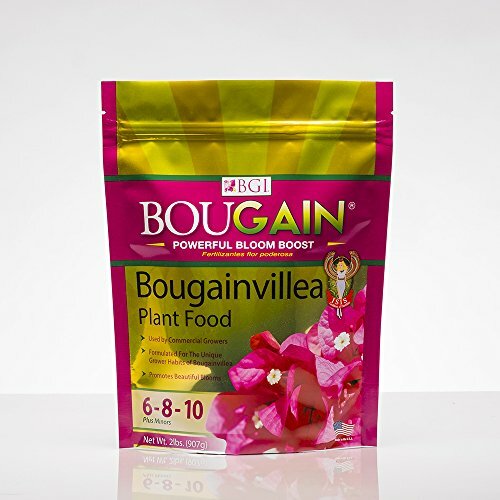 Not only is Bougain formulated to dramatically increase blooms, it addresses the bougainvilleas Achilles heel - their thin and brittle root system. Ten years of research and testing led to perfecting this specialty plant food that dramatically increases blooms, strengthens roots, increases color vibrancy in both foliage and bracts, and produces an all-over healthy bougainvillea. BGI focused on the customer, listening to the issues and challenges of both the weekend gardener and professional landscaper, and met those concerns with this easy to use fertilizer that is unmatched in quality and functionality. If you have any questions about this product by BGI Fertilizers, contact us by completing and submitting the form below. If you are looking for a specif part number, please include it with your message.